I was floored at how solid, how tight, the band was. The only bummer was the sound during the first few songs, where there was no lead guitar in the mix, at all; that could have ruined the evening had someone not fixed it within a song or two. There were seats all the way up to the edge of the stage and plenty of arms in the air all the way up from and all the way up to the front row of the very upper balcony. They filled the room, easily; the person probably the most surprised by this feat was Brian Fallon himself, who could not thank the audience enough times. It is funny how I feel so different about this latest wave of bands referencing the Clash and the ‘Mats and the other bands that at this point are in me so hard you’d need a bone marrow transplant to get them out. I remember talking with a younger friend about Rancid (round about Lolla ’96, when I turned my back against the barrier and read a magazine while waiting for DEVO and Soundgarden) – my point was that I saw the Clash, his point was that he didn’t and wasn’t ever likely to and therefore Rancid and their ilk was the closest he was ever going to get. 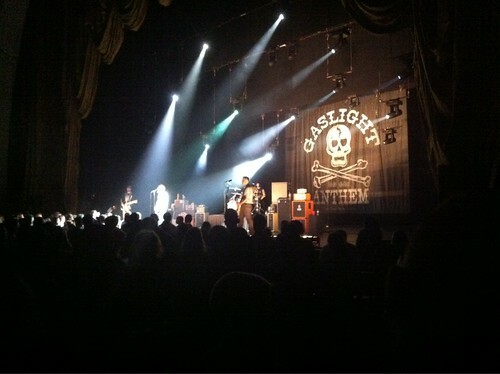 I don’t mind the constant namechecks and references with the Gaslight Anthem; in fact, quite the opposite. I like bands that wear their musical hearts on their sleeves; I was in the right place tonight. If the World’s Tallest Man was in front of you, then you were!